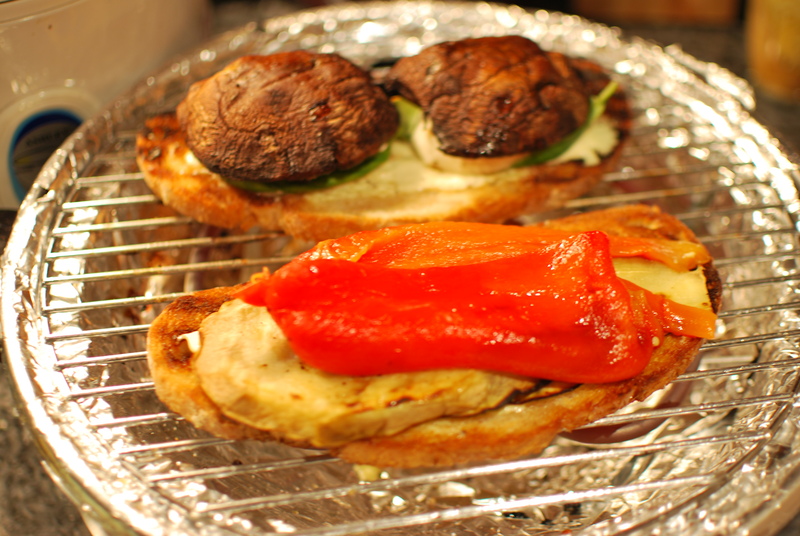 Pre-Heat the Oven on Broil at 350 degrees f.
Take the Red pepper and with a pastry brush, brush vegetable oil all over the red pepper, make sure that the creases are also covered in the vegetable oil. 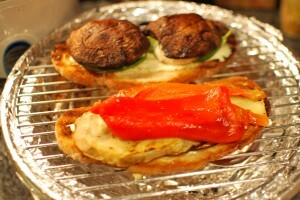 Place the red pepper on the top rack of the oven on a backing sheet, 5-8 minutes on each side. When you see that the red pepper is turning a little black on top grab a pair of tongs and flip the red pepper on the other side for another 5-8 minutes or until it starts turning black. Once the pepper is ready place it in a bowl and cover it with saran wrap (plastic wrap) for 15-20 minutes. While the pepper is cooling off in its bowl, take the white onion and cut it in 1/4 cut. Rough chop it, you want big pieces of the onion to put into your sandwich. Take a non-stick pan and place the butter and onions on medium-low heat, season with a little salt and pepper and add paprika. Leave cooking until you see the onions soften, then place covered and leave on warm stove. While the onions are cooking, begin to heat up an indoor grill, while the grill starts warming up take the eggplant and cut off the skin. Cut both ends off so that the eggplant stands up, then cut about 1/2 inch each straight down. Cut 3 pieces and wrap and refrigerate the remainder of the eggplant for dinner tomorrow or another day. Once you cut the eggplant dribble a little bit of olive oil on top of each piece and season with salt and pepper. Place the eggplant on the grill about 5-6 minutes on each side or until you start seeing the grill marks. Take the portobello and rub with a little bit of olive oil, season with salt and pepper on both sides. Once you have room for the portobellos place them on the grill about 7-8 minutes on each side or until the portobello begins to soften. While that is cooking you can now take the red pepper out of the bowl. It will be soft so you can just pull the stem right off, cut the red pepper in half and scrap out all the seeds. The skin of the pepper will peal right off. (You now have a roasted red pepper, remember you can always buy them in a jar, but I think this way is so much better). While the vegis are grilling you can make the mayo. Take 1/4 cup of Mayo, mix with half a lemon wedge and add a dash of salt and pepper and 1 1/2 tsp of garlic powder. Stir good and refrigerate until ready. Well of course I’m going to say it’s good, I made it, but in all honesty, I have to admit, it really was just simply Delish! My boyfriend loved it, not only is it healthy, it’s delish. 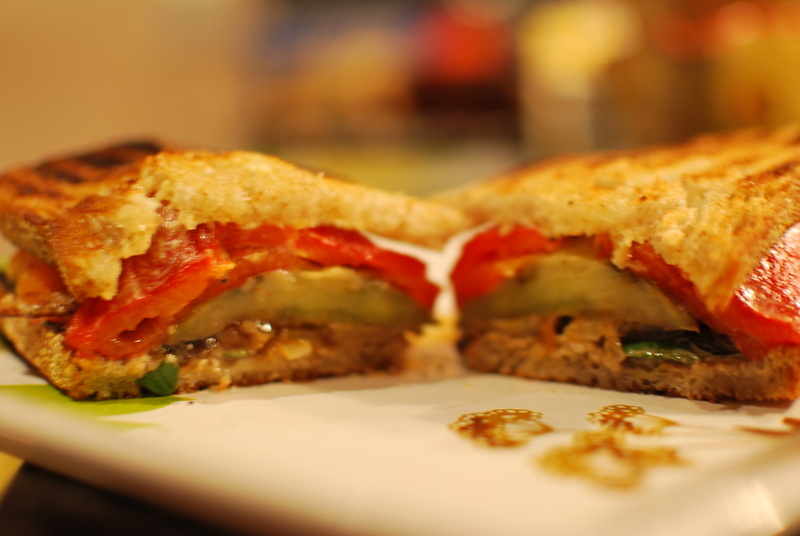 The sweet pepper, with the eggplant and portobello, and onions ohhh and that garlic mayo it’s all just so good. The mozzarella cheese just melts in your mouth and you get that little kick from the basil leaves. You have to try this recipe. If you do let me know how it comes out. I got here looking for sandwiches recipes and must say this is a great recipe. I think this is an innovative post because in all the recipes I find, you are given the cooking instructions and the ingredients but this post describes the ingredients as a shopping list. It makes it friendlier. It is common to hear that Veggie recipes taste flat but that is not true. The fact that a recipe does not have meat does not make it bland. With bell pepper, paprika and garlic, this meal is as sumptuous and nutritionally satisfying as any other. Hi: I see this is an old post but I got here looking for veggie recipes. I do collect them but I find this one great. Though we are all turning to veggies for a healthy lifestyle and to avoid cholesterol, we must also ensure that the veggie recipes we choose are healthy. WE should not only avoid fattening food but also derive the necessary ingredients we need as your recipe seeks to. Many thanks for this insightful recipe.